I had no idea I was intuitive, until in a dance class one day, the teacher said to me ‘You are the most intuitive member of this class’. I was quite shocked, it was something I’d never thought about. I knew that my mother was considered very intuitive, but this was made light of. My (then) husband could sniff the wind to find an address – pretty impressive I thought. My own intuition – I’d never even considered it. So intuition has crept up on me so to speak and little by little more and more each day, I trust what it has to tell me. I would counsel you to do the same, listening to the hunch, the feeling, the knowing, the image; everyone has their own way to connect with their intuition. I love the idea of the still small voice. My mother says that if she doesn’t listen to that voice (which is often drowned out by much louder voices) things don’t turn out well for her. I love to give email tarot readings to people, to help them on their way with their issues and problems. Also, in creating this site, I would like to encourage people to develop their own innate skills, to learn to trust themselves and their intuitive powers. Otherwise other people, peer pressure, the media, religion, dogma and all those other outside authorities, hold the guiding reins of our lives. So here’s a simple exercise. 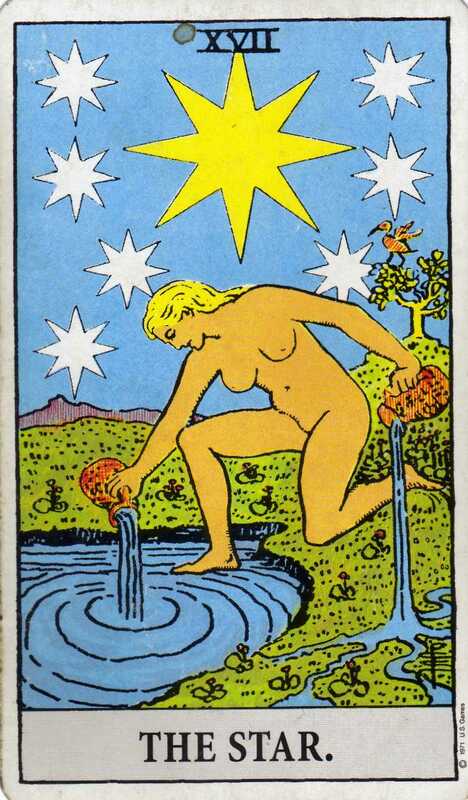 I would like you to breathe deep as you look at this picture of the tarot card, The Star and see what impressions come to you. These impressions may come to you in the form of feelings, words, images, symbols or as a knowing. Write down what you receive. This will only take you a few minutes. You can post your impressions as a comment if you like. There are no wrong or right answers, only deeper levels of understanding. I will do the same and post my impressions on the Intuitive Impressions page. Take a look at mine too, if you like. Click here to subscribe to the bi-monthly Intuition Development Newsletter – ‘INTUITIVE’. Each subscriber is automatically entered into a draw for an Intuitive Tarot Reading, the winner will be announced in the Newsletter.